From the frozen shores of Lake Ladoga to the burning ruins of Stalingrad, relive some of the most intense battles of WWII,where entire Army groups disappeared faster than a single battalion on the beaches of Normandy. This expansion follows Expansion one, the Terrain Pack. 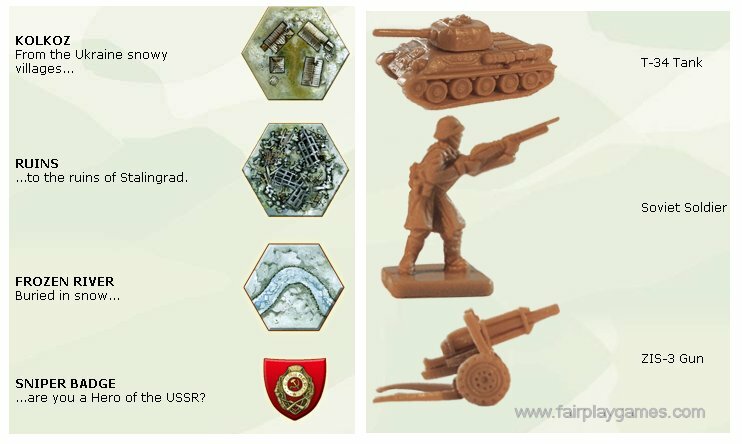 While the Terrain Pack focused on new terrain and rules, the Eastern Front expansion is devoted to the ferocious battles that pit the Axis and Soviet forces against each other. Also included is a scenario drawn from the Russian-Finnish war, and an Overlord scenario of what turned out to be the largest tank battle in history: Kursk. A complete Russian Army set including 42 Russian soldiers, 24 T-34 tanks and 6 ZIS-3 guns. A Political Commissar chip marker. 10 round markers including Soviet medals, minefields & battle stars. 4 obstacles, including Dragon's teeth & snowed-in bunkers. 14 Special Unit badges, including Combat Engineers, Cavalry, Snipers & Ski troops. 8 Historical Scenarios, from Finland to Stalingrad and from Operation Typhoon to Barbarossa. Also includes Kursk in Overlord format! New Rules, including the infamous Political Commissar rule! 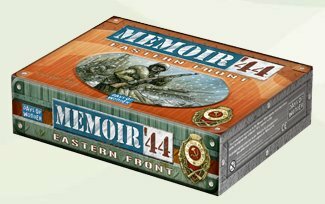 Outstanding expansion to Memoir '44. New units, terrain, scenarios, strategies. Highly recommended for all fans of the base game. Nice expansion for a great game. It adds new miniatures, terrain, rules and scenarios - a lot of content to extend the life span of the original game. This expansion adds various new elements to the game, including new miniatures, new rules and, perhaps most importantly, new scenarios. If you like the base game, this is a must-buy, since it provides more of all the good things while still keeping the attractive simplicity of the original. Amazing! I really cant help but love the new units like the calvary and snipers!